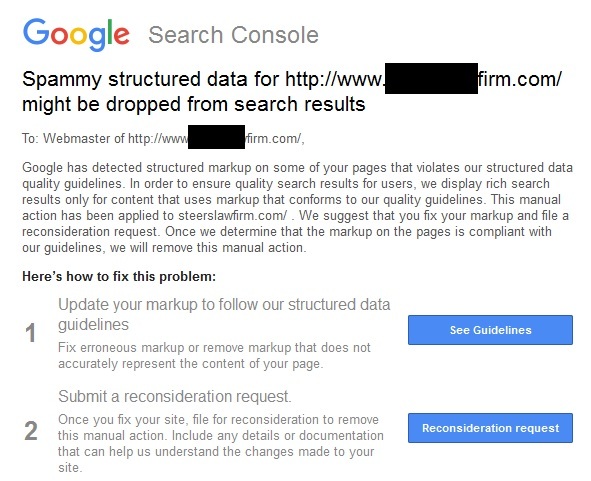 About a month ago I wrote about “Spammy Structured Markup” messages being sent out via Google Search Console. Since then I have now seen multiple sites with this “penalty”. It isn’t much of a penalty, sites affected simply have their review stars removed in search results. The only problem is, people are getting penalized even though their reviews are totally visible to humans and they have followed all Google guidelines. I believe I have identified the problem and how Google is incorrectly penalizing some webmasters as I have now seen multiple sites penalized using a specific format to their markup where the code is placed immediately after the visible text. This is a real issue for Google and they are actively penalizing sites not in violation of their own webmaster guidelines. As soon as my workaround is fully tested I will post a solution for both webmasters and search engines here. Meanwhile if you have unfairly received a notice of “Spammy Structured Markup” please do comment below or email me and I will keep your site confidential if desired.